In the previous chapter we added the circuit components to the canvas. In this chapter, we will start work on the wiring. We’ll make full use of the techniques we learned in the previous two projects, and especially buses and labels. The wiring of the connector. 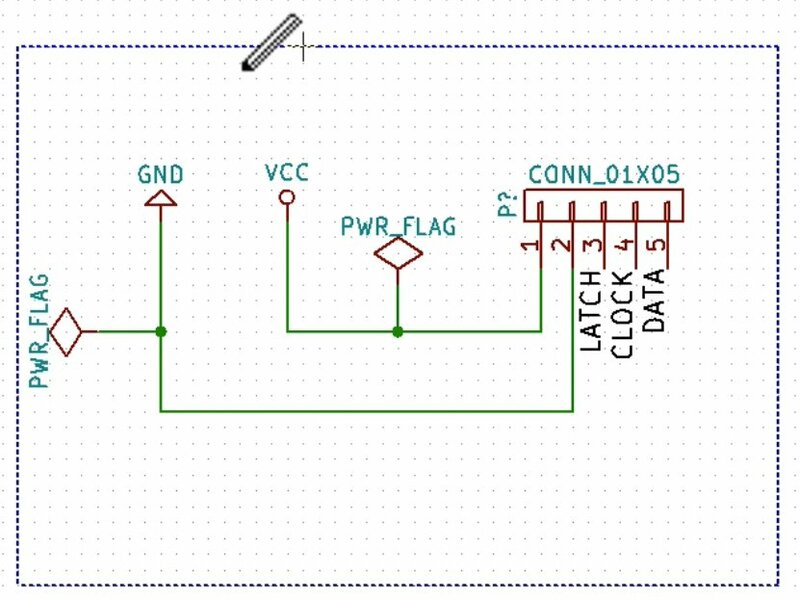 In the connector schematic, notice the GND, VCC and PWR_FLAG components, all added via the component chooser. We use labels for pins 3, 4 and 5, though which we will achieve connection with other parts of the circuit. 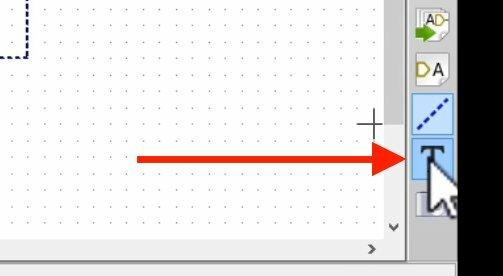 With the line tool you can draw boxes and other shapes. 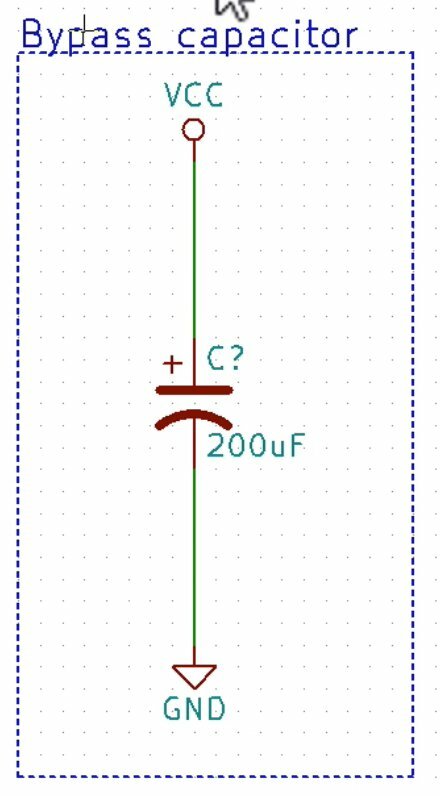 With a box outline, we can mark out parts of the schematic. 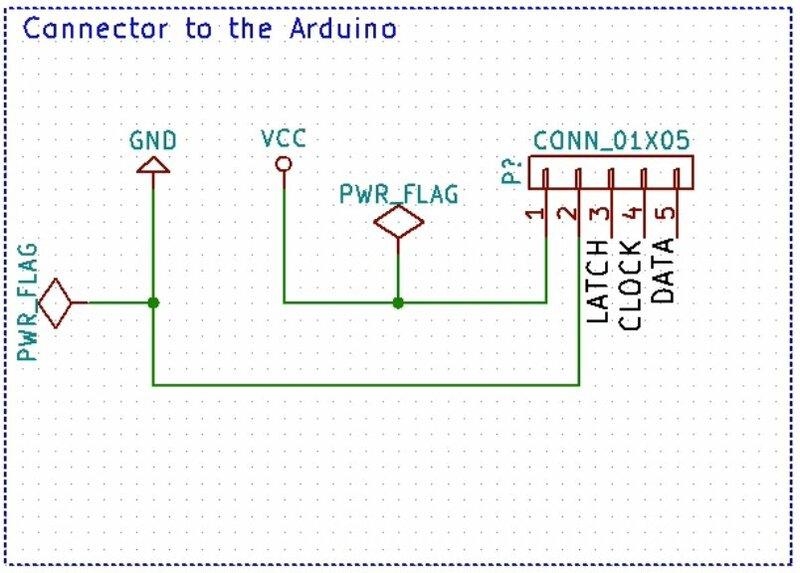 With the Text tool you can add arbitrary text to the schematic. Type some text in the text box, and click OK. 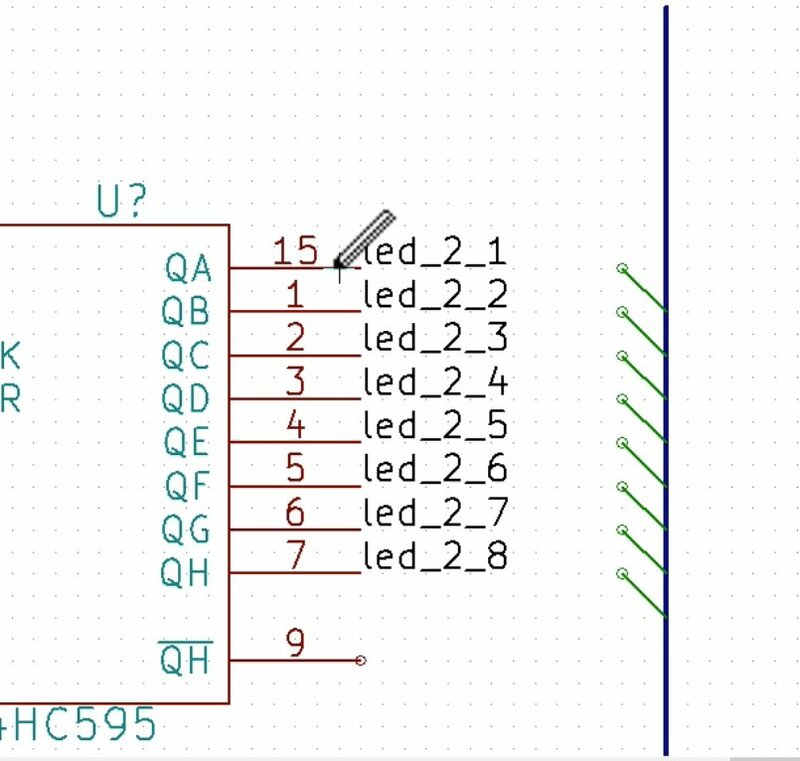 This part of the schematic is now marked and titled. The box and the title we just added are not part of the circuit! They only serve in marking out special parts of the circuit. 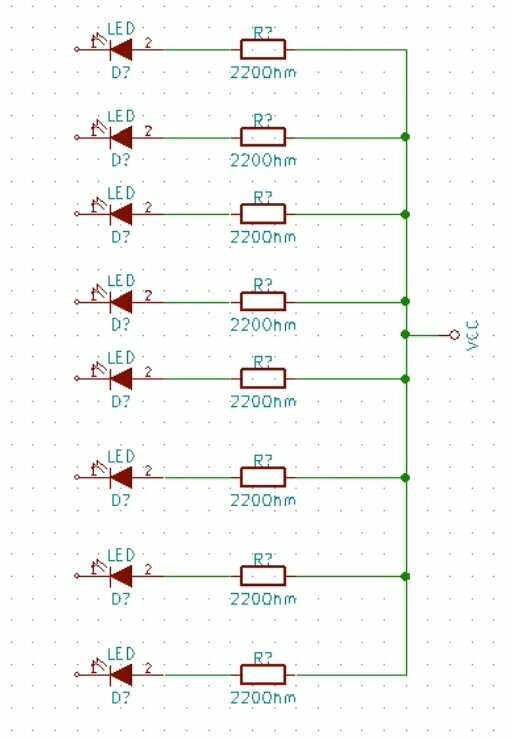 They just make the schematic easier to read. The capacitor part of the schematic, boxed and titled. Next, let’s switch our attention to the resistors and LEDs. 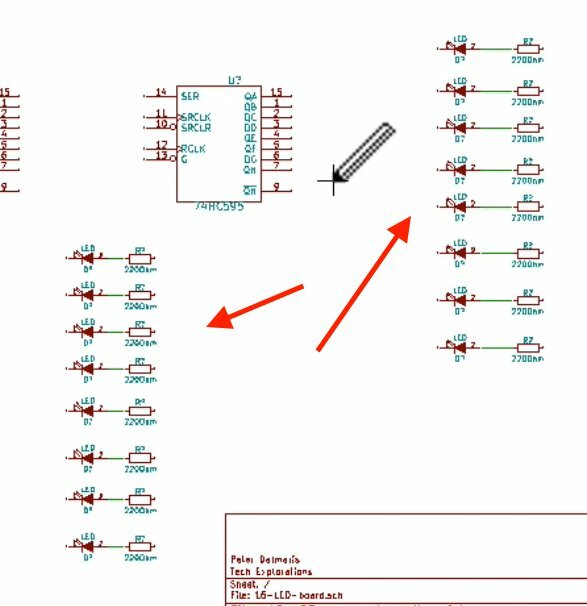 Because of the way we positioned these components in the previous chapter, one next to the other in two columns, we can simply use wires to connect them. 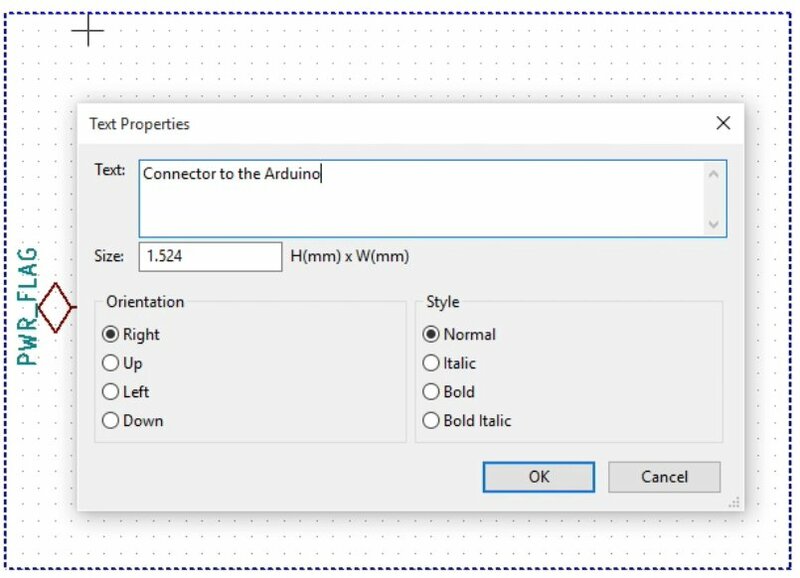 Type “W” to select the wire tool, or click on the Wire tool button from the right tool bar, and draw the wires. Use normal wires to connect the LEDs to the resistors. 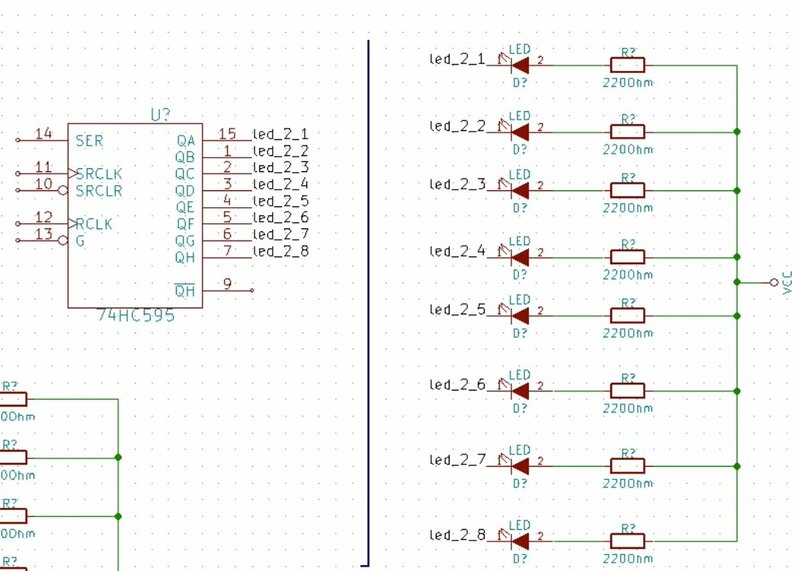 Added a VCC component, and completed the connections with the LED anode, via the resistors. Both LED banks connected to the VCC component via the current limiting resistors. We’ll continue with the data pins and wires. Because we have 8 data pins for each LED bank, it is preferable to bundle them together via buses. We will create one bus for each LED bank, and assign 8 data signals to each bus. 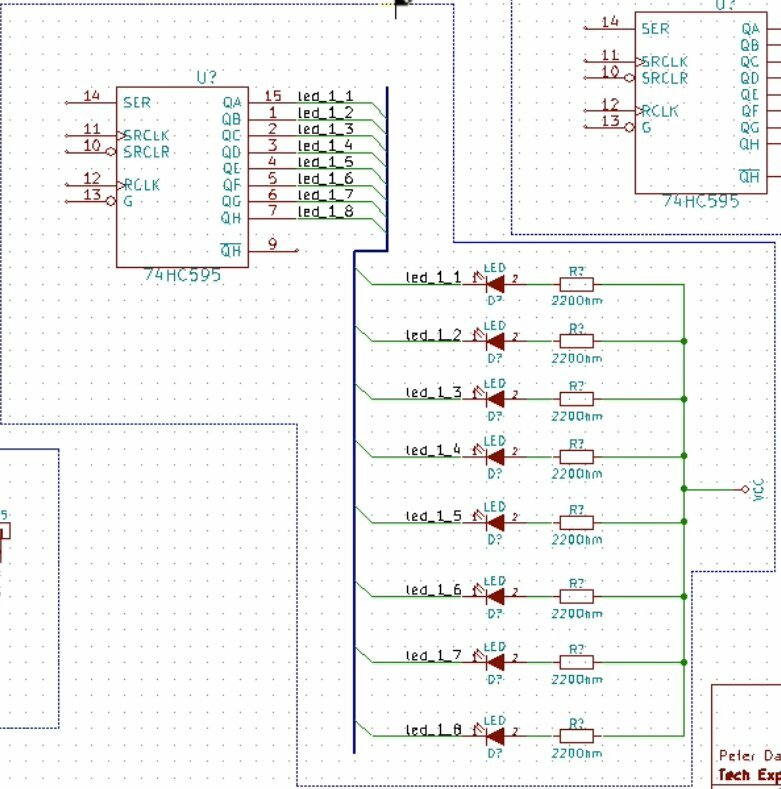 Start the process for the first bank by labelling the data pins on the shift register and the LEDs, then draw the bus, add the bus entries, and finish with the wiring between the bus entries and the pins. Select the Local Label button. The data pins and LEDs are now labeled. 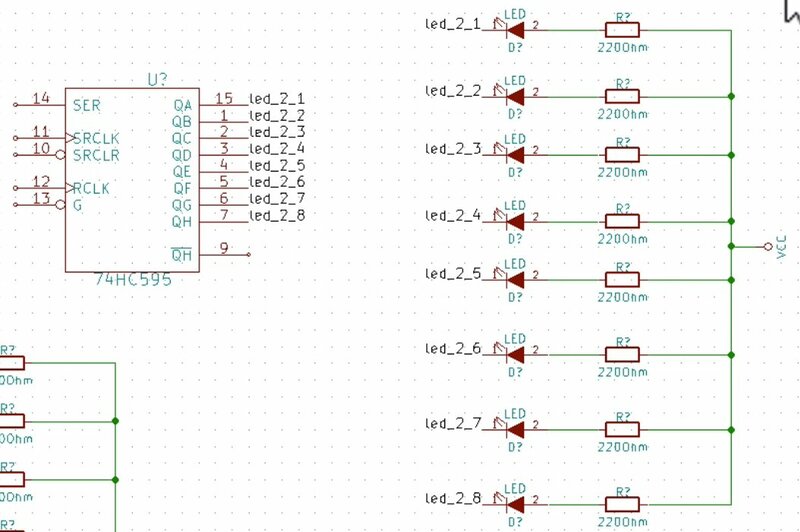 Notice how a label is structured according to a convention: “led_x_y”, where “x” is the number of the LED bank (in this example, we are working on bank 2 of 2), and “y” is the number of the data pin (1 of 8, 2 of 8 etc). Also notice that the same label is used for pins that are meant to be electrically connected. 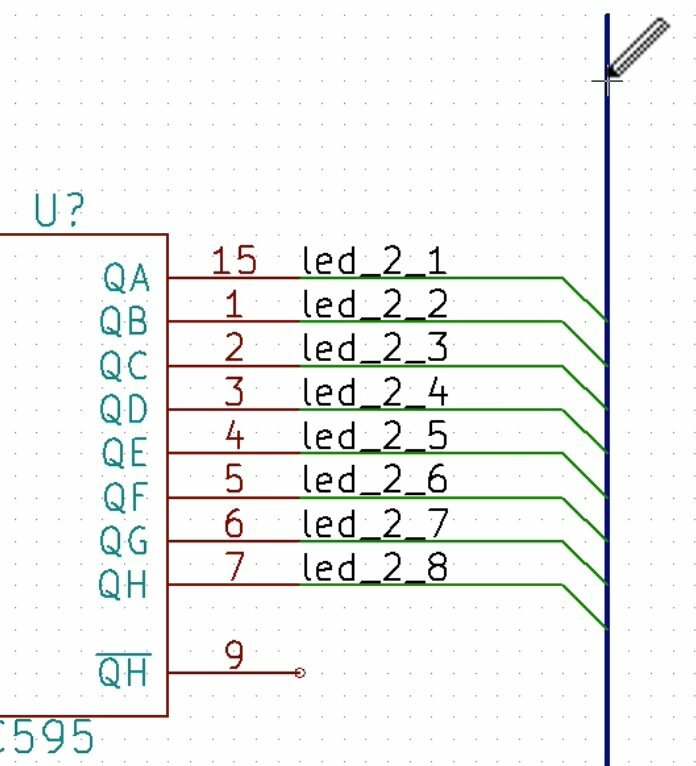 So, the shift register pin QA is meant to be connected to the LED at the top of the bank. The names of the labels will be used to name the corresponding net. Later in Cvpcb, we will see these nets again, so it is important to choose names that have meaning otherwise there is a good change you will get confused later! The blue line represents a bus. Added bus entries. They are very similar-looking to normal wires, except that they are at a 45 degree angle. The pins are now connected with a corresponding bus entry. The LEDs are now connected to the bus. 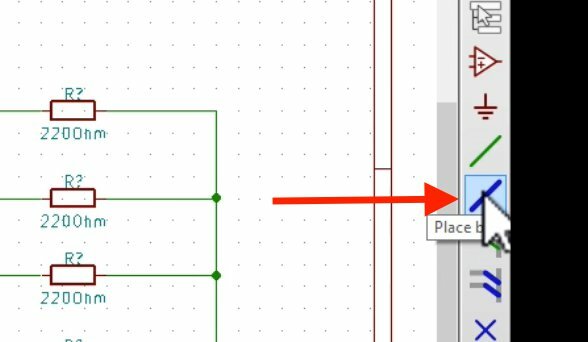 This part of the schematic highlighted and titled. 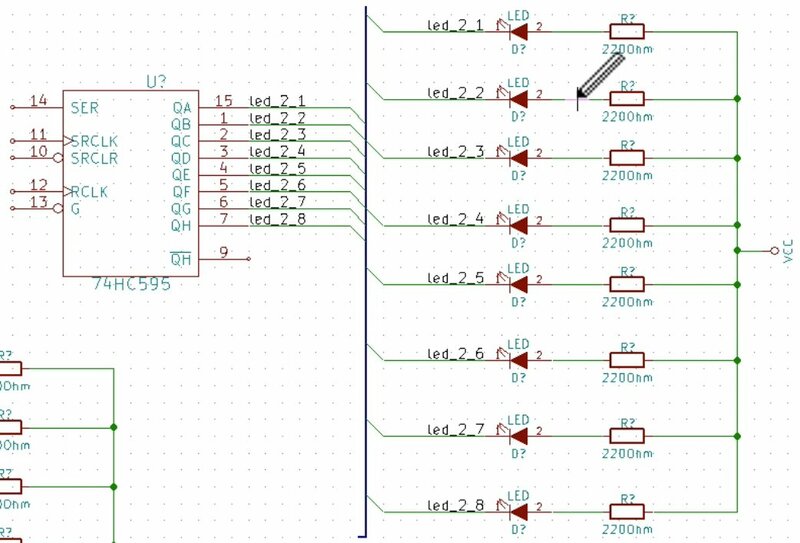 This is the LED Bank 1 segment of the schematic, complete with a bus, bus entries, net labels and wires. 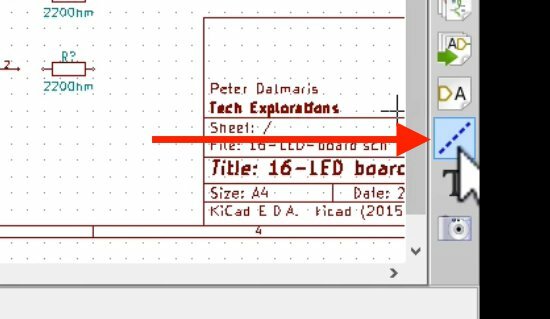 Detail, showing a text label with the name of this segment for the schematic. 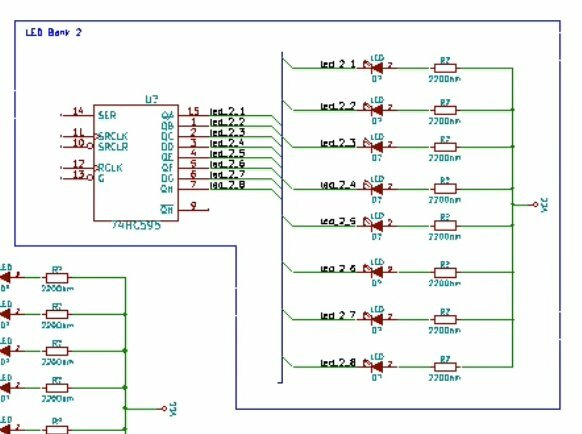 We have made substantial progress so far: the shift registers and the LED as connected via buses, and the connections to the capacitor and the connector are complete. 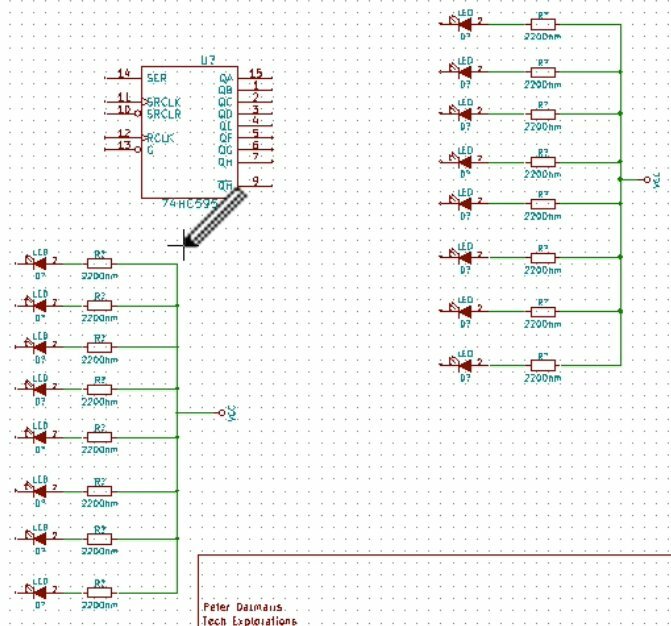 Next, we need to complete the circuit by connecting the shift register communications pins to the connector. We will use net labels for this. Let’s proceed to the next chapter and to get this done.